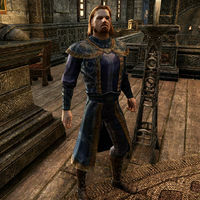 King Casimir is the Breton king of Daggerfall and ally to King Emeric. You'll initially find him inside Daggerfall Castle during Bloodthorn Assassins. Captain Aresin : "My Lord, you must go now!" King Casimir : "I will not! The dragon does not flee its lair!" Captain Aresin : "They're coming for you! Wait. What was that?" Bloodthorn Assassin : "Death to the King!" Captain Aresin : "Get the King out of here! Go!" Verrik : "What do we have here? A lizard with a crown?" Knight of the Dragon : "Go! We'll handle this!" Knight of the Dragon : "Head upstairs and protect the King!" Verrik : "No one will stand in Angof's way!" Knight of the Dragon : "Go! The King fled toward the stairs!" King Casimir : "Good riddance." King Casimir : "Captain, this isn't easy for me to say, but I want to apologize for ignoring your warnings." Captain Aresin : "It was nothing, my King. I apologize if I was impertinent in my duty." King Casimir : "Not at all, Aresin. Rise, please. In service to Daggerfall, our friend here is to have any support the watch or the knights can provide." Captain Aresin : "Of course. We'll do whatever we can to help find Angof and determine his motives. All of Daggerfall stands behind our hero." "It would seem that the Captain's concern for me was well founded." "You saved me from this assassin's blade, as well as from my own foolishness this day." "Indeed. The body on my floor proves that." "Who was this man who came to kill me? What did he want?" The assassin was Verrik, but he worked for someone named Angof. "Angof? I've heard this name whispered by my agents." "The royal spymaster reports of unrest across my kingdom stirred into a froth by this Angof, but that's all we know." They wanted to create chaos by assassinating you. "Creating chaos is a method, not a goal. It's a means, not an end." "There's more going on here than chaos for its own sake. We must get to the bottom of this." "Oh yes, my friend. I hereby grant you special dispensation to investigate the villain Angof in my name. " "But you must keep this quiet, for we don't want to tip our hand. I shall never forget your service this day, however." "Go forth and know that Daggerfall and the crown stands behind you." This page was last modified on 10 September 2018, at 02:57.